We slept in today and almost missed the hotel breakfast. They were super nice about it and did not rush us at all. I just had a simple breakfast with some toast, yogurt and boiled eggs. 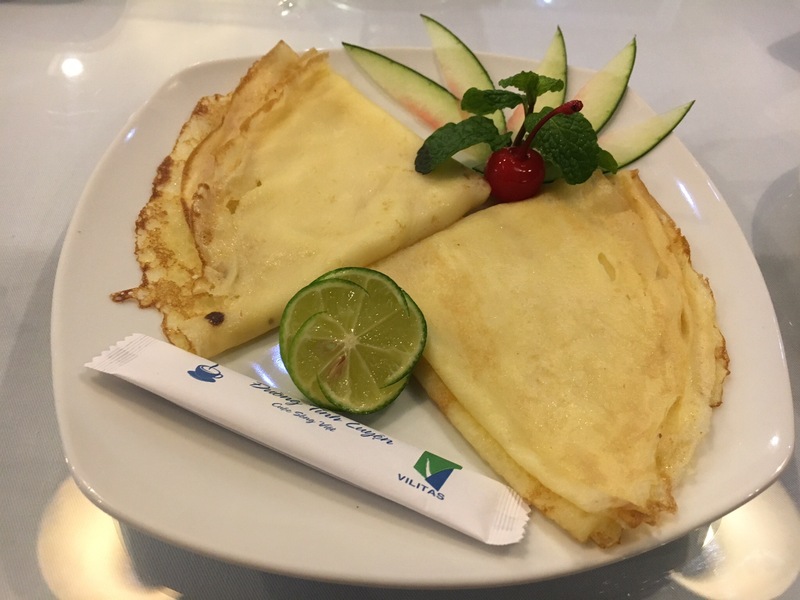 They thought I didn’t order enough and also gave me a lemon crepe to try as well as a plate of fresh fruits. Onwards to our tourist attraction of the day: The Temple of Literature. This worshipping site was destroyed by the war and later restored. It also housed the first university of Vietnam back in 1076. It was a nice place to look at nice courtyards and architecture and to learn a little about the history of temple. The temple was mainly dedicated to Confucius and there is a huge statue of Confucius along with his principal disciples In the main building of the temple. 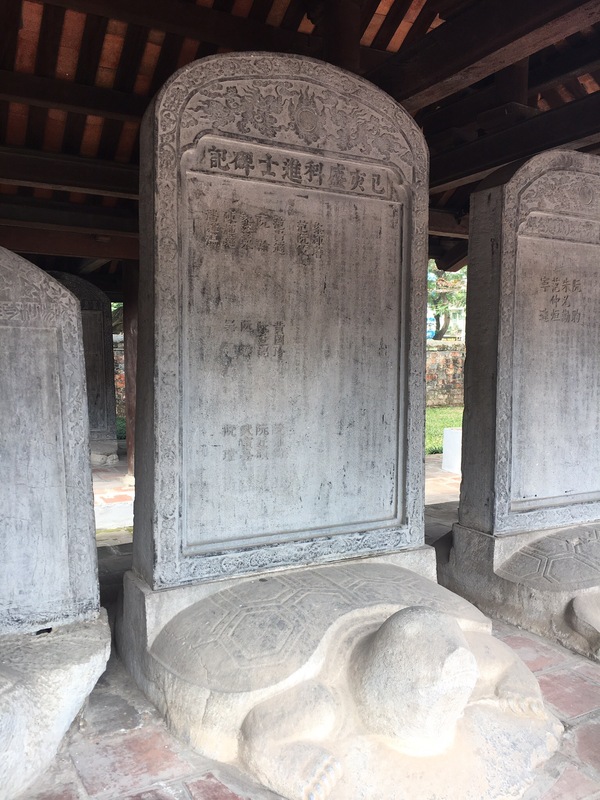 Another interesting part of the temple was the stone stelae on stone tortoises, which was used to record the successful candidates of the state exams. Aaron asked if I wanted my name to be mounted on a stone on a tortoise and I thought that would be pretty neat. We were getting hungry so we decided to get some lunch at the “Cheesecake Factory of Vietnam”. The restaurant was called Quan An Ngon. The menu was huge with all sorts of Vietnamese dishes. Around the restaurant were different stations for each type of food. Apparently, the point of the restaurant was to bring all the street food vendors together under one roof. We decided to have a bit of a seafood feast with the coconut juice shrimp and grilled mackerel, along with some morning glory (my new favourite vegetable) and rice. Aaron also pointed at a picture and we ordered that too but the service here was spotty and we had to ask for the rice and also this mysterious starter that we didn’t get until the end of the meal. The shrimp was amazing. They were huge and when dipped in the warm coconut juice and lime/salt mixture, it brought out the fresh taste of the shrimp even more. Our server even came by to help us carefully peel the shrimp for us! 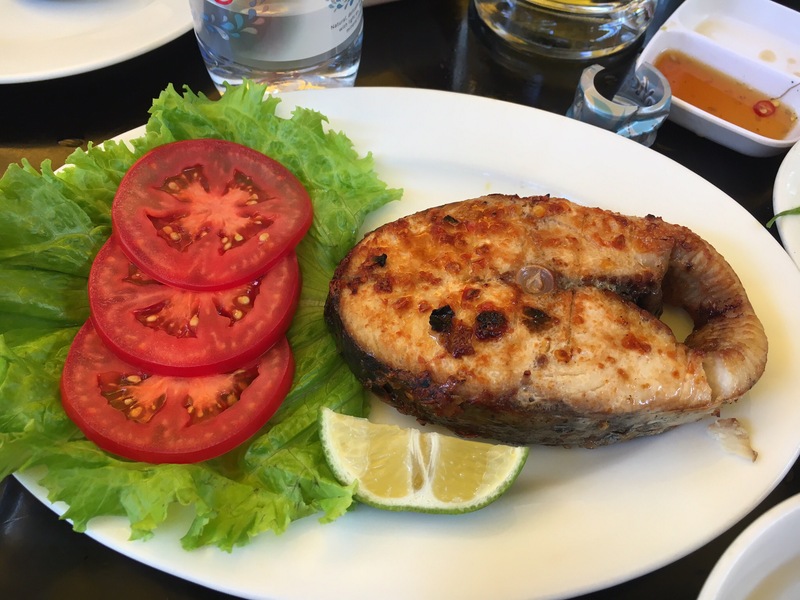 The grilled mackerel was good but a little on the salty side for me. Our mysterious starter eventually came after some prompting. 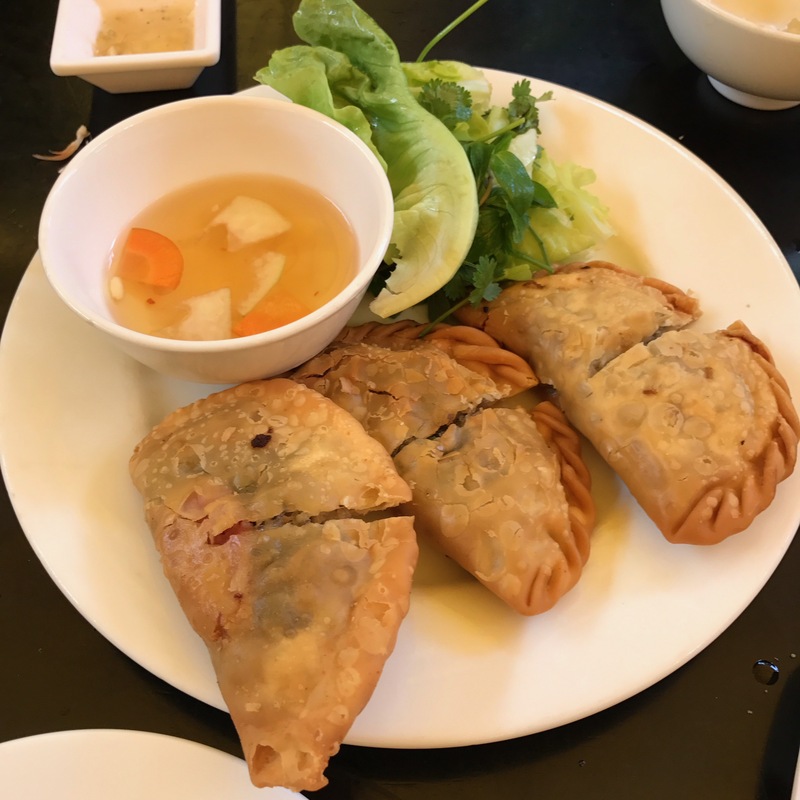 We found out it was Banh Goi, kind of like a Vietnamese samosa, filled with vermicelli, pork and mushrooms. It was very good. We, then, headed over to Highland Coffee by the lake to catch up on some work, while watching the lake scenary turn from day to night. It was time to get some dinner! We decided to change it up and get some pizza! I know. I’m ready for the haters. Why am I eating pizza in Vietnam, you might ask? My taste buds actually need some new excitation, from all the Vietnamese food we’ve been eating. This pizza restaurant, Pizza 4P’s, owned by a Japanese owner has amazing ratings on Foursquare. We needed to try it. 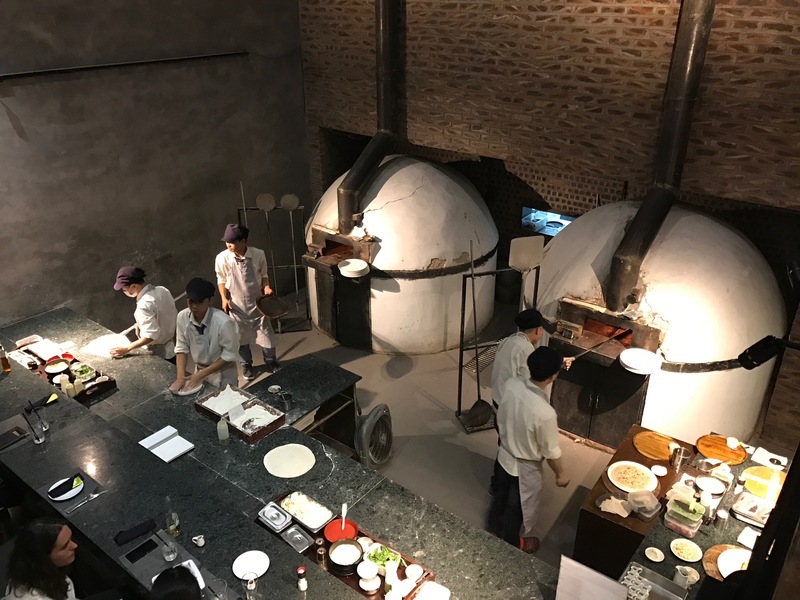 They have many interesting pizza choices, including some Japanese inspired toppings such a miso and okonomiyaki. The setting and service was very upscale, probably the most upscale we’ve had since the beginning of our trip. 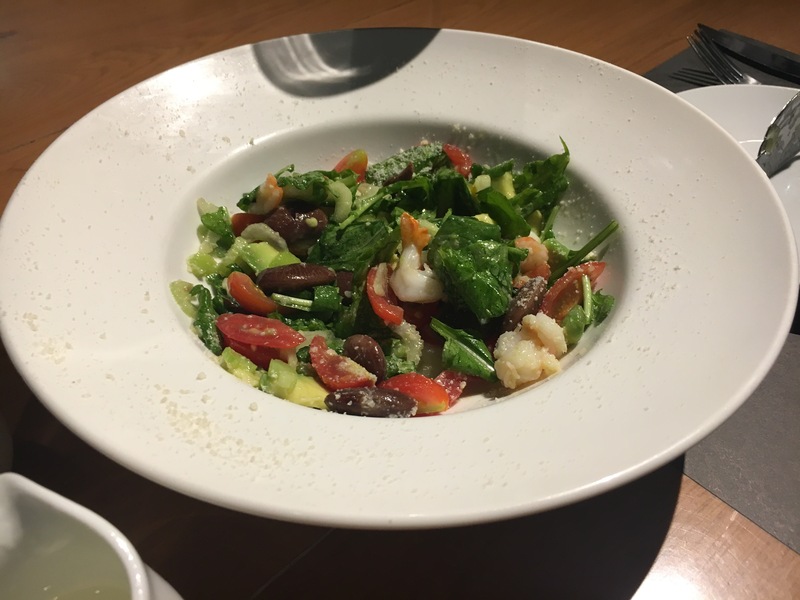 We started with the shrimp, avocado and bean salad and then tried the half and half option of their burrata prosciutto pizza with the Milano salami and Da Lat chorizo pizza. Aaron had a glass of a Chilian Cabernet, which was a really smooth, sweet red wine choice that I really enjoyed. 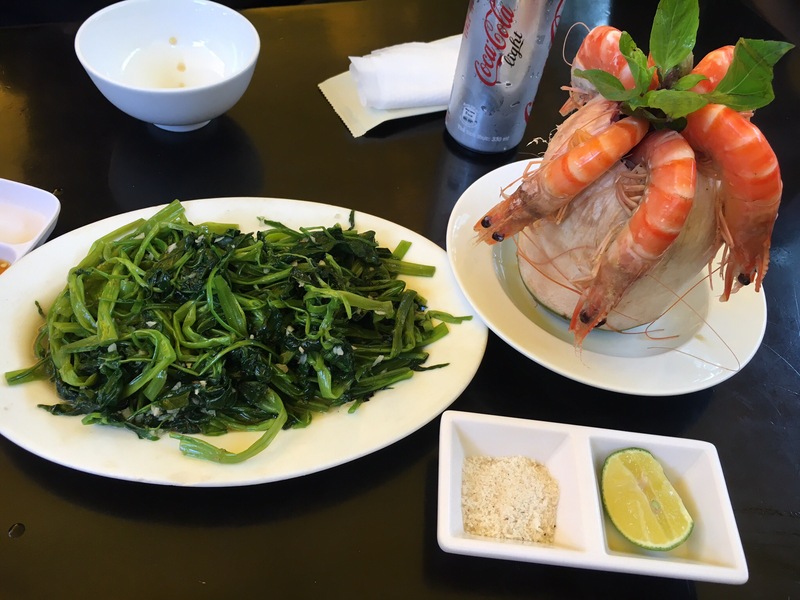 The salad was very tasty, with the lemon dressing and somehow tasted very Vietnamese. It must have been the basil they used. I guess cannot truly get away from the Vietnamese tastes! The pizza was a thin-crust pizza with a huge ball of burrata in the centre. (We already ordered the smaller cheese size.) Our server helped us cut it up into quarters and laid it flat on each slice of pizza. First bite of the cheese was amazing. It was mild, soft cheese and worked very well with the prosciutto. Then there was the salami and chorizo side, which was super tasty as well. I still preferred the burrata side more though. On further reading, we discovered that the cheese was made in a cheese factory in Da Lat, with 2 Japanese cheese makers involved, one of whom studied cheese making in France. Interesting! I am so glad we decided to come here. My taste buds got their necessary excitation. Aaron wasn’t quite full, so we decided to get some dessert at Wanna Waffle. It was a cute waffle place hidden inside a Circle K convenience store. 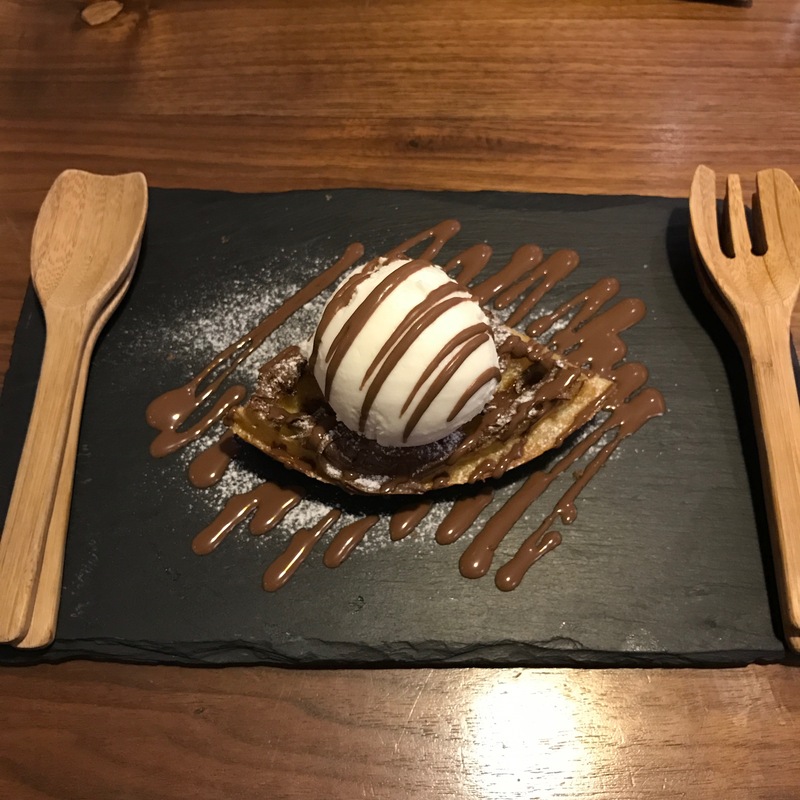 Aaron chose the classic waffle with Nutella, chocolate sauce and coconut ice cream. The coconut ice cream was legit! You can really taste the real coconut flakes in there. This was much better quality than the other ice cream we’ve had in Vietnam so far. With our bellies satisfied, we headed home. The hotel provided some free Da Lat wine for us to try, after hearing that our anniversary was coming up. 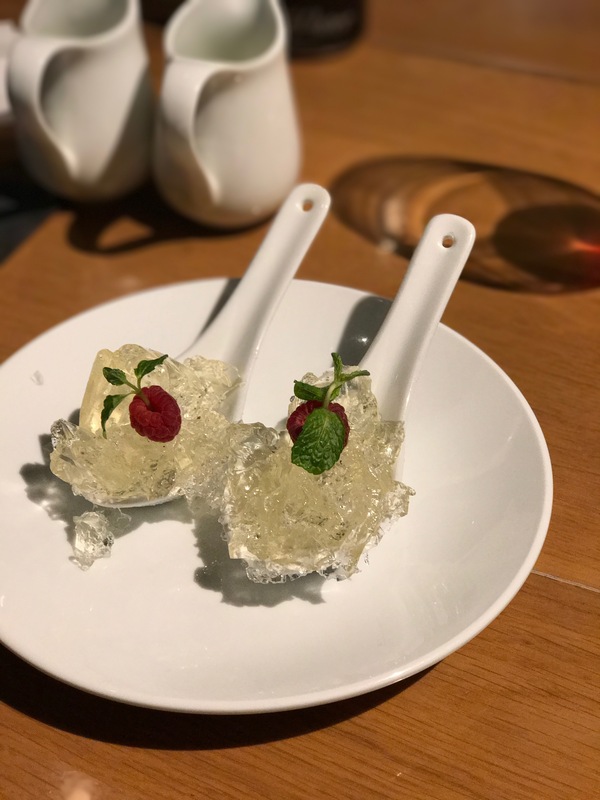 The taste was different, perhaps because it was made from mulberries. Nonetheless, it was nice to end the night with a glass of wine while blogging. I think it actually may be a chain from Europe but that was lost in translation. I don’t know if there are many pizza/pasta places in Hanoi but I know it’s in the foreigner district and delivered by moto-taxi to my place. It came in pizza boxes and the rose penne is absolutely incredible! Mind you, I did discover it after being away from home for months so that inevitably had an effect. So curious if I remember it correctly so I hope you try and find it and enjoy as much as I did! Unfortunately we have moved on from Vietnam so we wouldn’t get to try the amazing pasta you speak of but it’s so interesting to see that they have good Italian food! I would expect the French cuisine to be good there but not Italian!